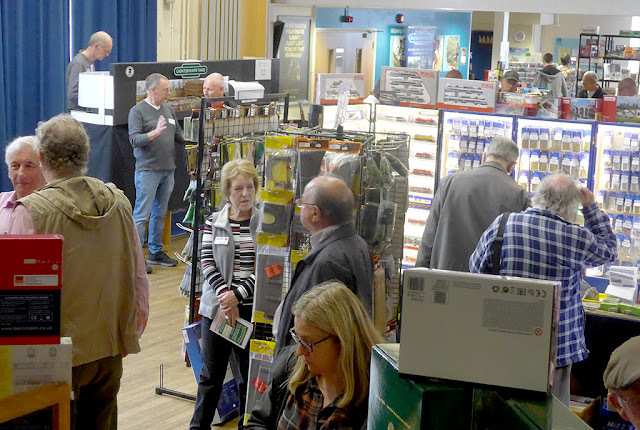 The regular monthly meeting date for October is normally a week out, the second Sunday of the month is usually taken up by the Model Railway Exhibition held in the church hall Willmington where we meet. The October meeting is normally held one week later. 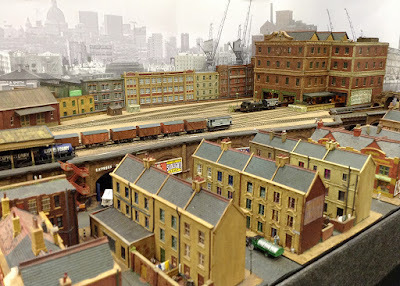 However, this year the 'home' exhibition did not take place, and the following weekend saw Lightermans Yard as a guest layout at the Croydon Model Railway Society exhibition held at Warlingham which took place on Saturday 13th and Sunday 14th. Arrangements were made and Pete K and Keith collected Lightermans Yard and transported and set it up at the Croydon show on the Friday evening. When left, all was functioning ready for the next day and the public. 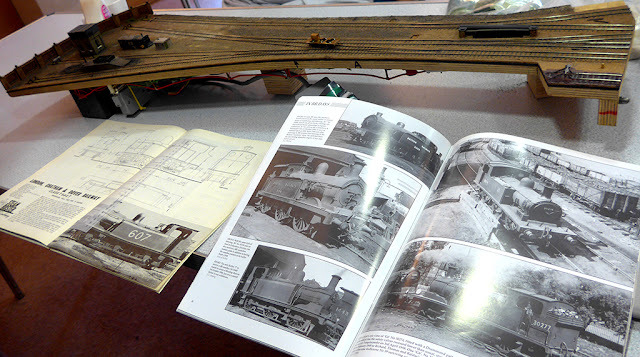 Croydon Model Railway Club Exhibition was held at Warlingham School and spread over two halls. 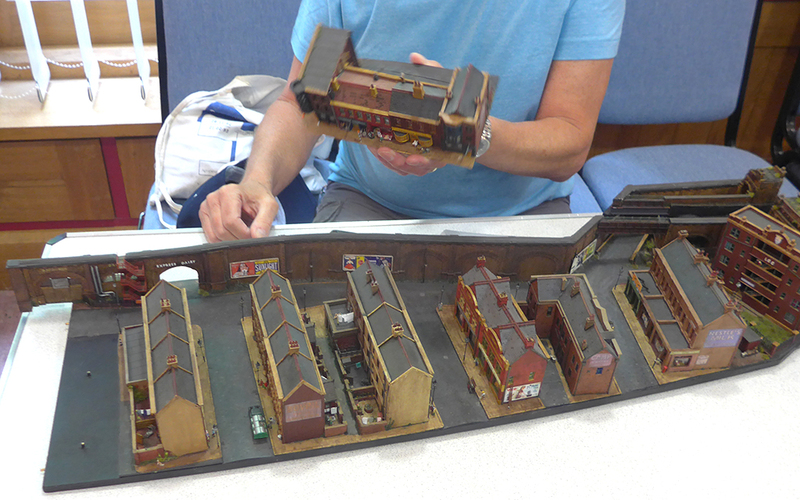 There was a mix of layouts and models in different gauges, and club and trade stands. Attendance was quite low on both days. Lightermans Yard attracted a good share of interest, much of it directed at the scenic treatment. Operating locos and stock started off well on Saturday with almost everything running to plan. 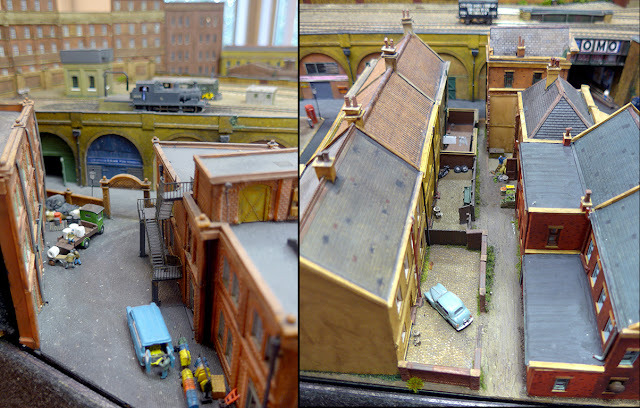 Trains arrived and their wagons and vans distributed to the warehouse roads. 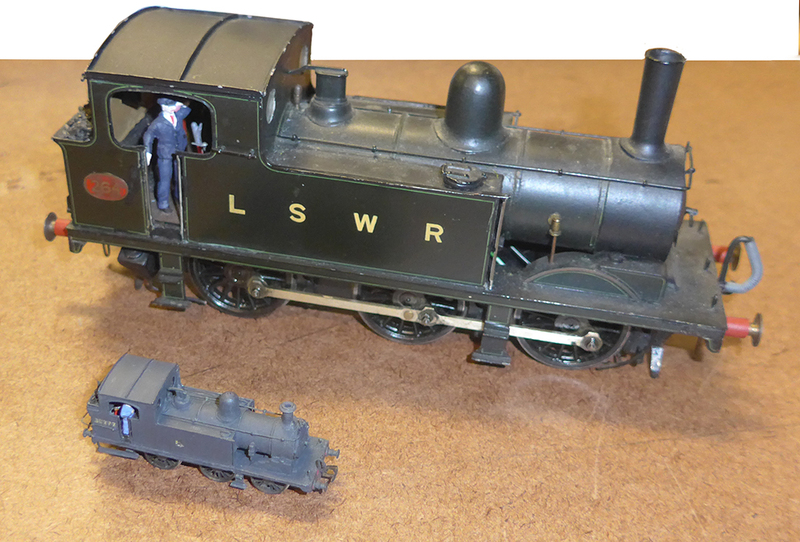 The brake vans shunted and new trains formed, collected by trip locos - steam and diesel. Other yard operations were carried out, such as the milk tankers to the diary siding. 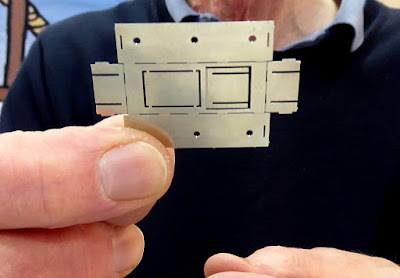 In general the uncoupling magnets behaved well at the beginning of the day, but manual 'hand of God' instances tended to increase as the day wore on. On one occasion one of the shunters was spotted taking up the rear of a newly formed train as it's trip loco vanished off scene! Over the weekend the incidence of uncoupling failures increased, but we operators soldiered on. 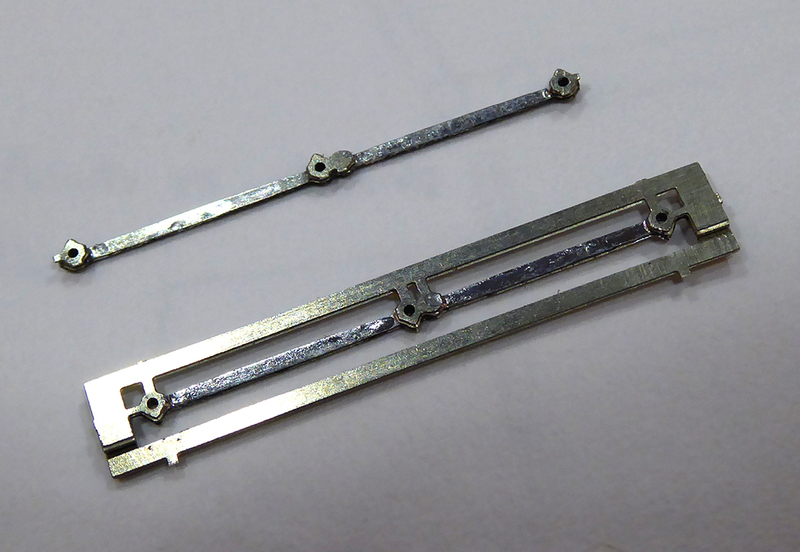 Apart from the suspected causes of the problem, we had problems with the loops on the DG couplings of recently introduced new/old stock (a job for the future). By the end of Sunday, apart from experiencing a few other problems such as discovering the DCC controlers were malfunctioning (a suggested solution by the man from MERG) and most of the magnets had given up, an exhilarated but exhausted crew struck the layout into its's boxes and reloaded Pete and Keith's cars (in the rain!). Lightermans Yard in the thick of the show! 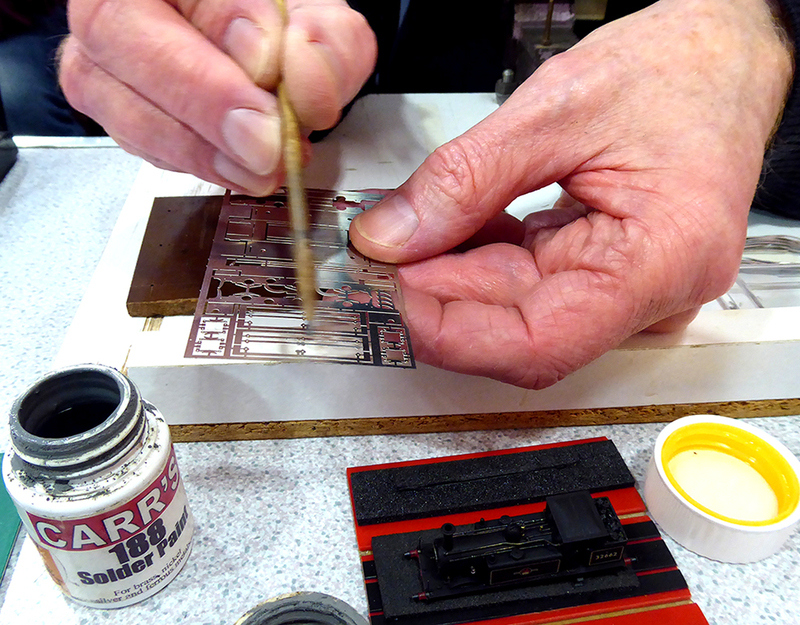 It's all in the detail - Even we ourselves are sometimes surprised by the scene! 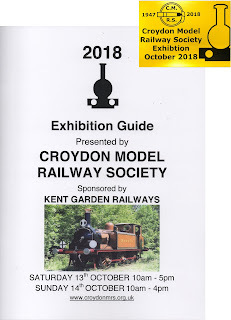 The focus for this meeting was the upcoming Croydon MRS exhibition at Warlingham on 13-14 October. Our main concern being transporting the layout. The Willmington show, which would have normally taken place on the second weekend in October, is not taking place this year. It normally displaces our regular meeting schedule and usually moves our meeting for that month forward a week. 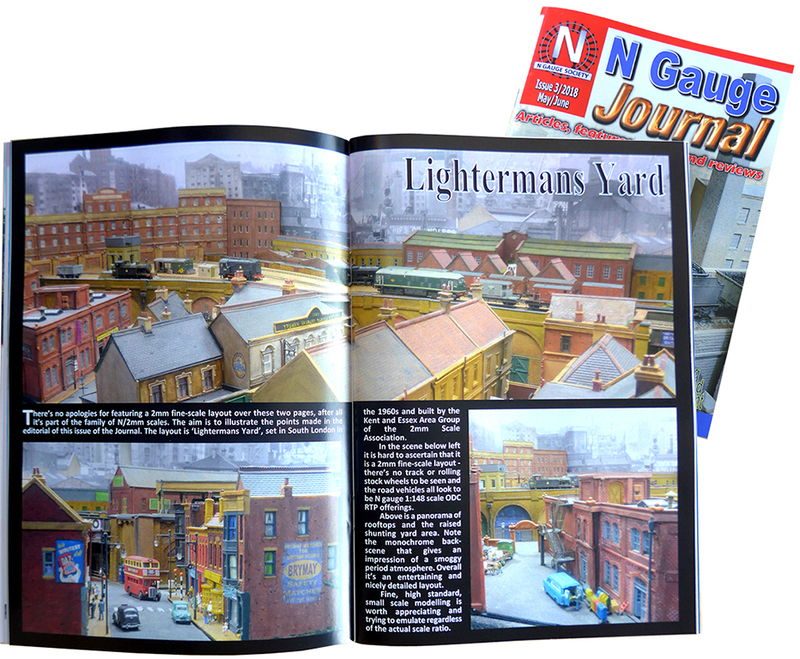 We were able to agree with our 'N' gauge colleagues to have the meeting on 7 October which is more convenient for transporting Lightermans Yard to exhibition. We set up and tested the layout in preparation for the exhibition and hopefully eliminate any electrical glitches that might occur. For the November meeting, we decided on a masterclass/workshop on locomotive chassis construction and conversion. The probable first candidate will be converting a Dapol Terrier to 2mm finescale. 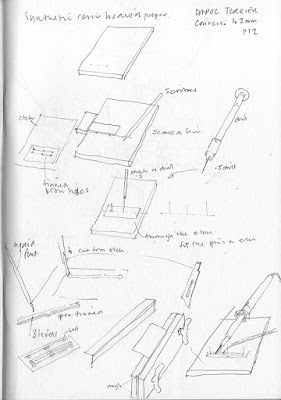 (11 November). 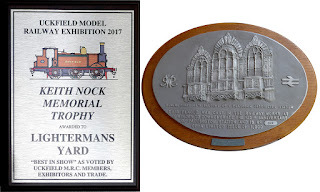 As promised a plaque has arrived from the Uckfield exhibition acknowledging Lightermans Yard being the first winner of the Keith Nock Memorial Trophy. 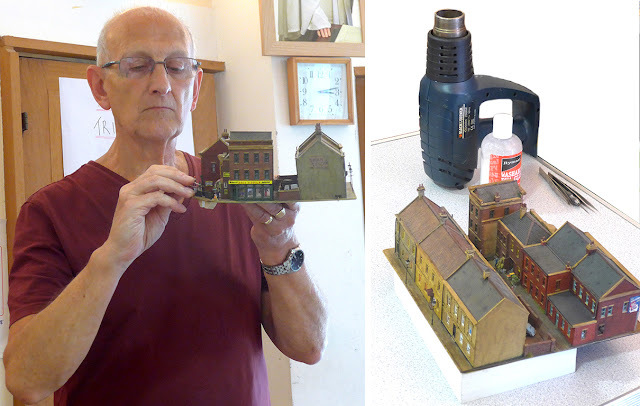 Also we have to return the Geoff Jones Layout Trophy (below right) awarded at the last AGM by the 2mm Association for best layout. 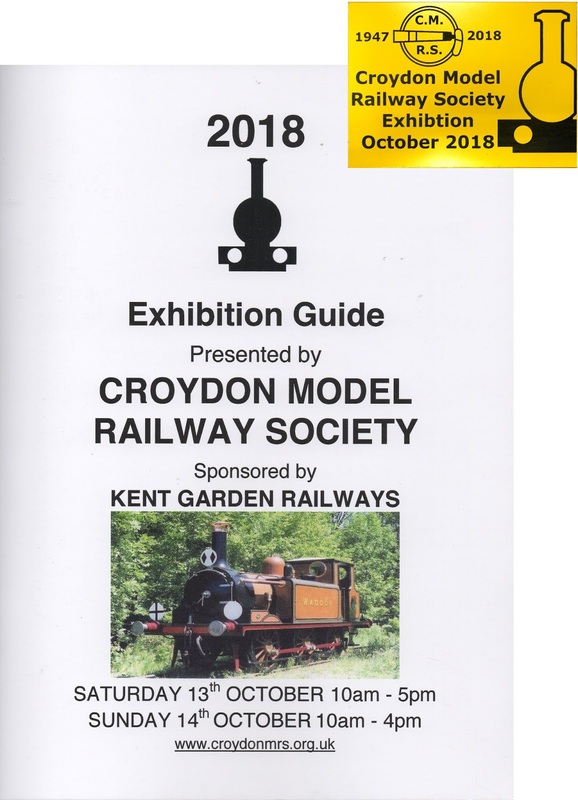 Note; Next meeting Sunday 7 October at Wilmington; Croydon MRS exhibition at Warlingham Saturday and Sunday 13-14 October; Sunday 11 November locomotive workshop on conversion to 2mm finescale. The August meeting was replaced by an outing to the Railwells show. Thank you to Alan S for agreeing to be photographer and guest editor for this month. David and I set off bright and early at 7am sharp. We had arranged to meet with Keith and Gordon at the Church at Wilmington at 8am. Cars parked up we set of with David at the helm and what seemed like no time at all we arrived at the wells show just after opening time at 10.40. Straight into the main hall we hit the ‘North Cornwall line’ and, it seems, most of the southern contingent of the 2mm Scale Association. 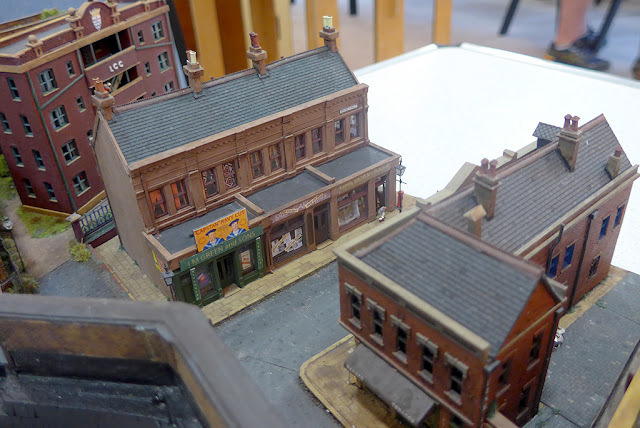 Mini MSW by Alan Whitehouse. 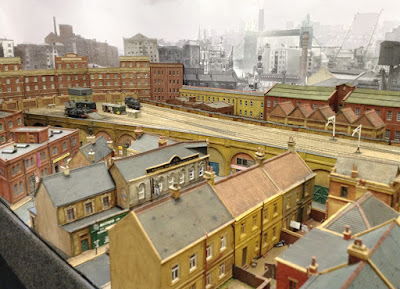 Bordesley North and Callerton are both new layouts and between them show a good few novel ideas with sound locos being much in evidence. 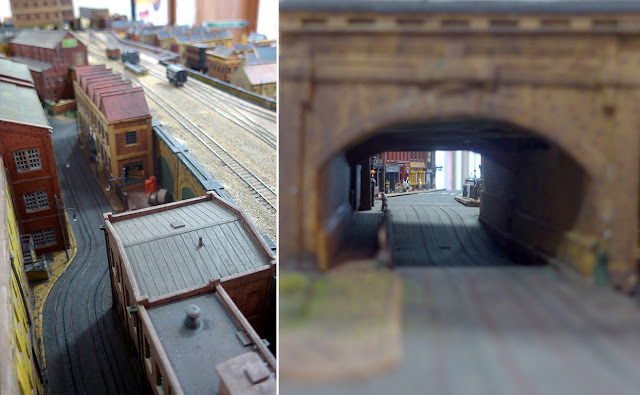 Mini MSW is another layout to feature sound on some locos but to me the revamped scenery was the major attraction. 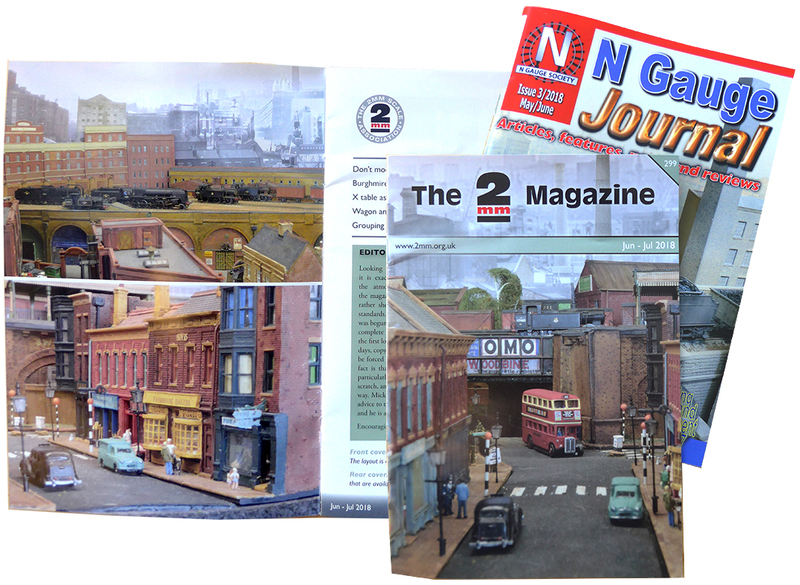 Looking around the upstairs hall found some very nice P4 layouts along with the usual traders and societies. Off of the main halls were side rooms with further exhibits and traders a bit like Aladdin’s cave with wonders around every corner. 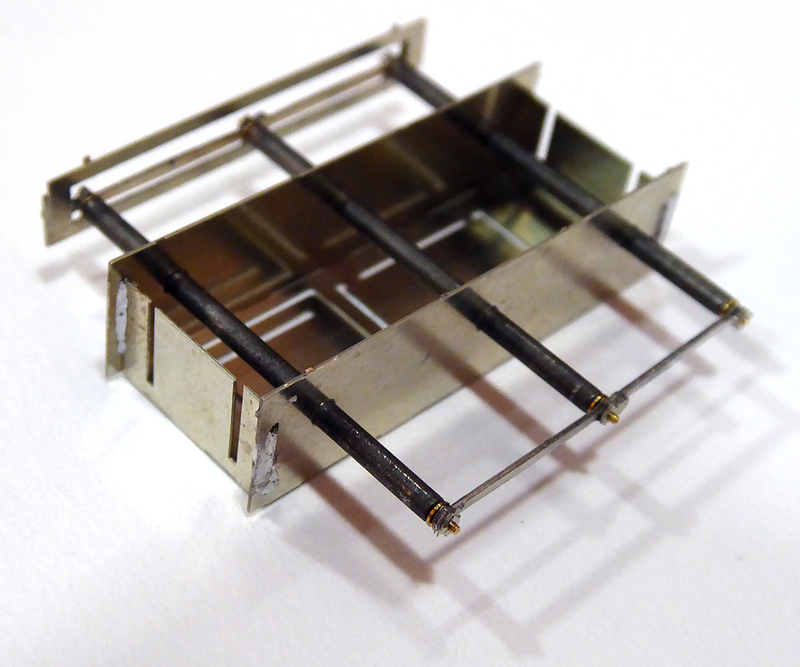 One layout, which had us all intrigued, was a T scale layout at ¾ of a mm to the foot. 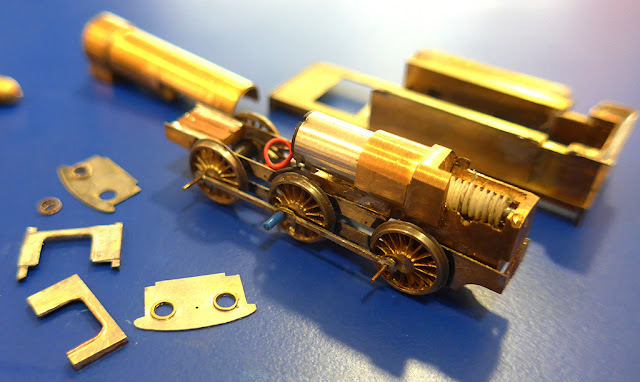 This appeared to run very smoothly and as none of the locos were powered everybody was wondering how it was done. 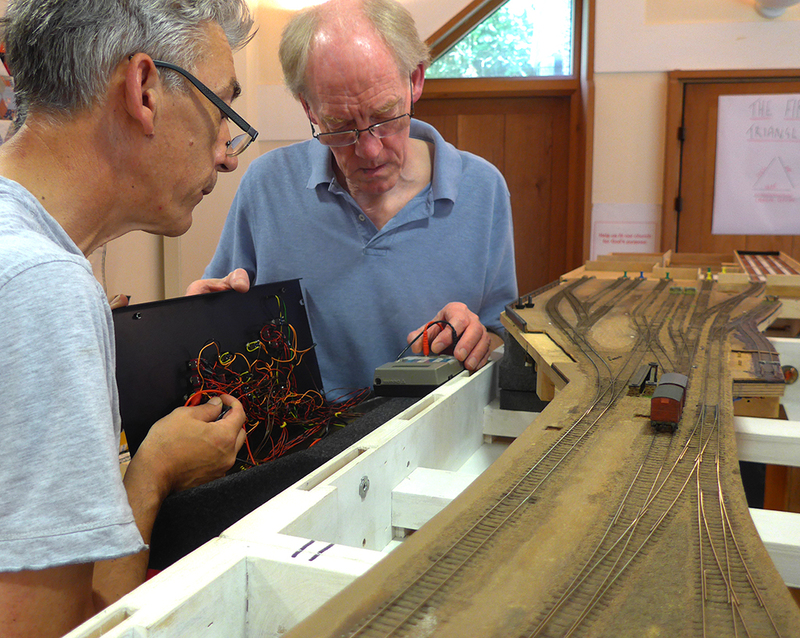 The owner of the layout was not giving anything away and stated ‘All with be revealed at 4pm’ (now that’s something we just had to go back for). The T scale layout. the whole thing was just over a foot long it ran very smoothly at a realistic speed. Quite a picturesque layout. It was by now time for lunch so we headed off to the Crown Inn next door. We all enjoyed a pint and a very large house beef burger, now that was a beef burger. Back to the show things were a little quieter on the North Cornwall line so we had a good look. 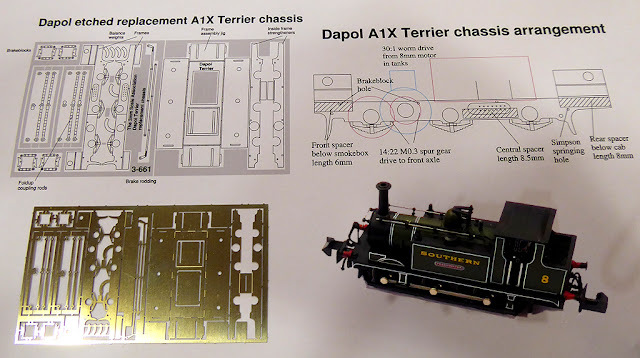 The layout was really 7 layouts in one and considering the somewhat damp and humid conditions is was amazing to see Johns locos perform so well, these could be tiny 4 wheeled locos crawling along over all manor of track work, without a hitch, or large express engines gliding along as though they really weighed the 70 tons or so of the prototype. John Greenwood's Wadebridge shows a King Arthur in southern brass livery I understand it is quite popular in the south! The handrails were particularly fine and well proportioned. 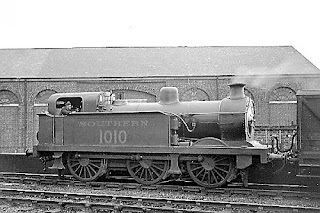 What a beautiful loco. 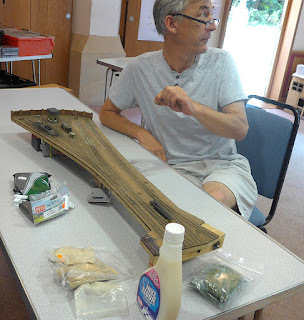 Wenford Bridge goods. the working crane and lorry still amaze me after all these years, worth the trip alone. The sign of a good show is when you look up from the exhibits and realise its nearly time to go, ’have we really been here all day?’ we just had time to get back to the T scale layout to see how it works. 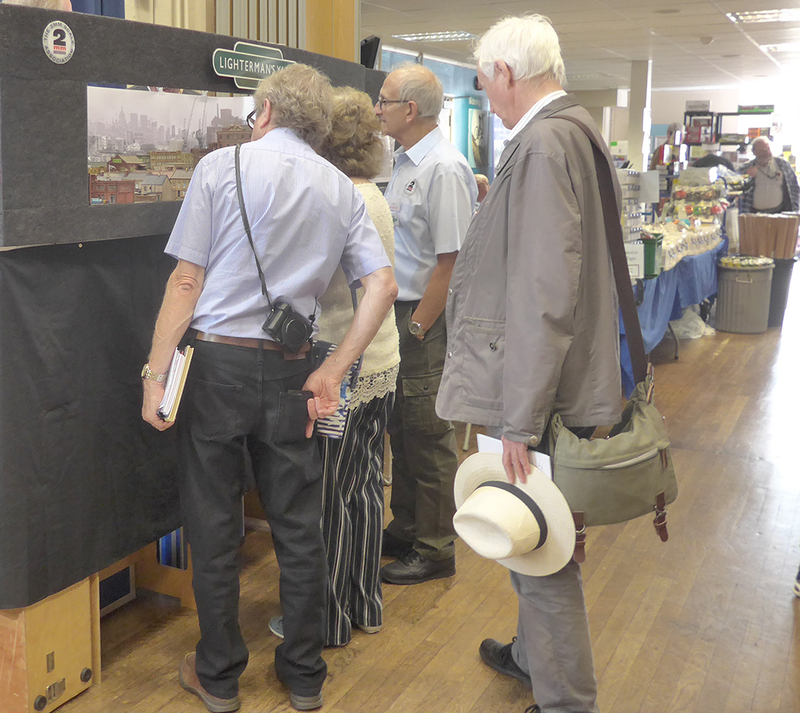 Sure enough a 4pm sharp the room where the layout was displayed was packed to the rafters! 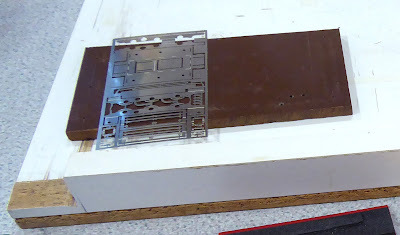 The little black box on the front of the layout hid the gubbins. 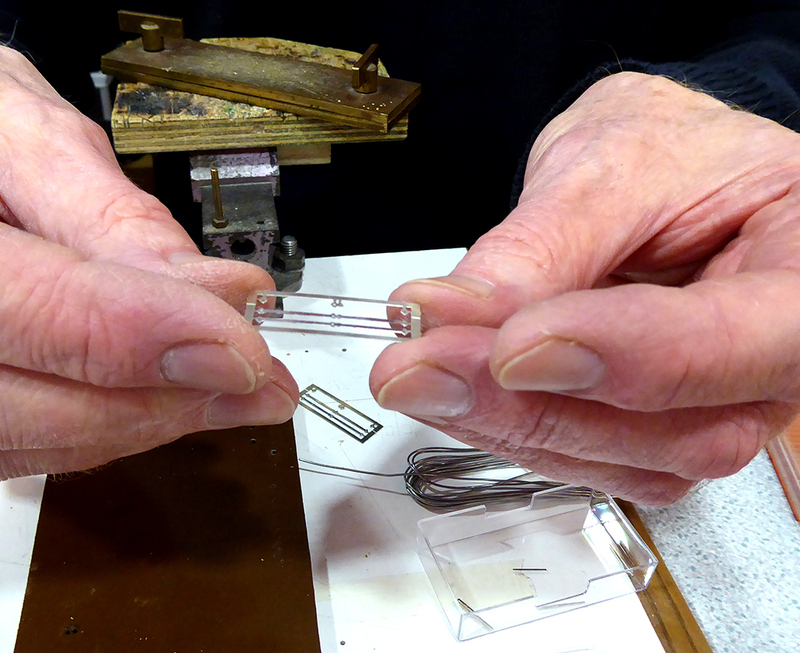 In true pantomime style we counted down the screws coming out of the box to reveal all…… A strimmer cable and some brass tube! 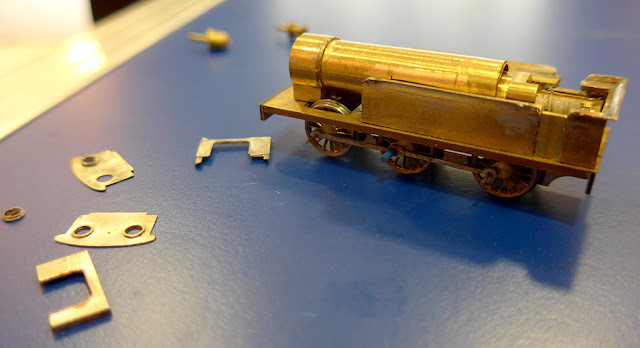 well not quite as simple as that but a very clever way of producing a smooth running loco to a minuscule scale. All fascinating stuff and so ended our day. Just the ride home and all the joys of the M25 on a Sunday evening which, indecently, did not disappoint due to a car fire after junction 9. This however only delayed us by around 30 minutes or so but overall we made good time. Thanks again to David for doing all the driving and to Keith and Gordon for all the banter along the way. This meeting was dominated by the unusual Summer heat, so everything appeared to take place in slow motion. Our plan was to continue ballasting and we did manage to carry some of this out, or we should point out that David did the work whilst the rest of us stood around watching and making encouraging comments and discussion. 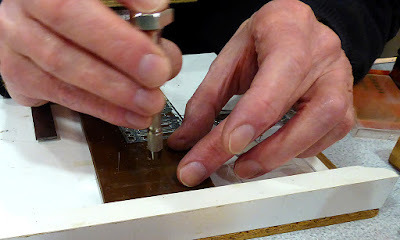 (below) David preparing to continue the ballasting, fixing the material with vinyl floor polish straight from the bottle. We had also identified a slight curl in one of the foreground scenic boards - noticeable if you knew where to look, but a nagging sense that the situation needed attention. Pete took on the task with the aid of a hot air gun, weights. 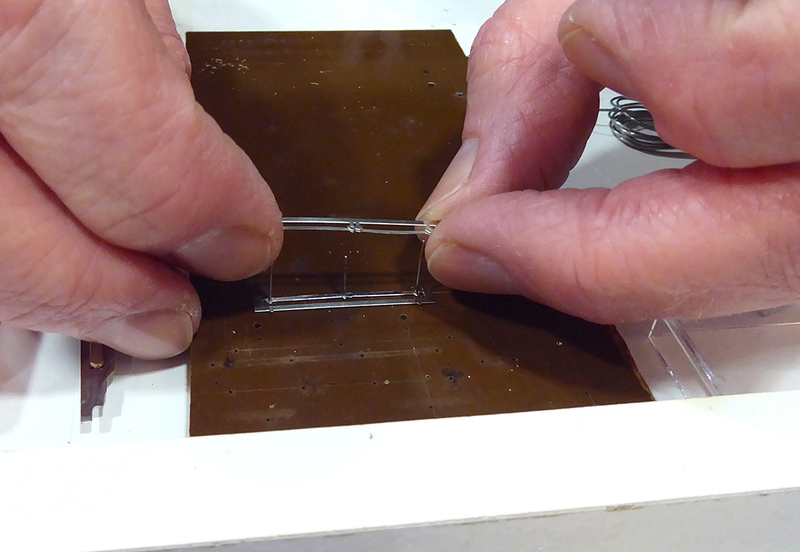 PVA and a little force, or a combination of all four accompanied by under the breath mutterings! We will see if this has worked when we assemble the full layout again. This meeting’s guest locos were Keith's SR/BR T Class 0-6-0 under construction. This model is destined for Lightermans Yard. 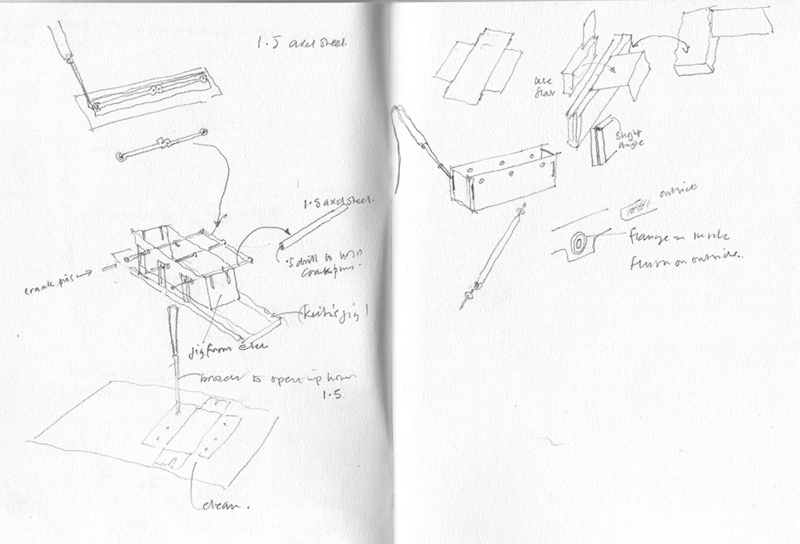 Shown below are the drawings (in 7mm scale) and pictorial reference. 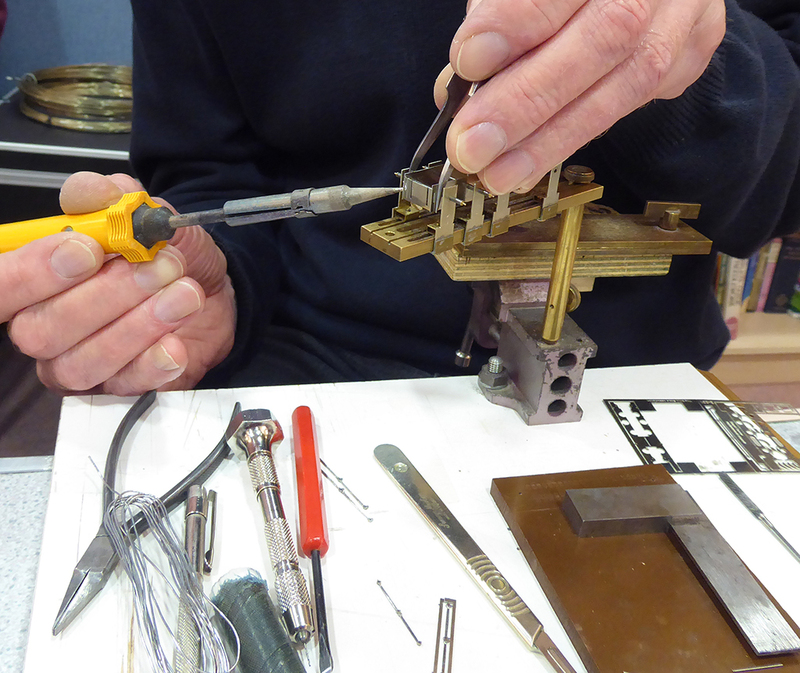 So far the chassis and gearbox have been completed, once again demonstrating Keith's superb micro engineering. 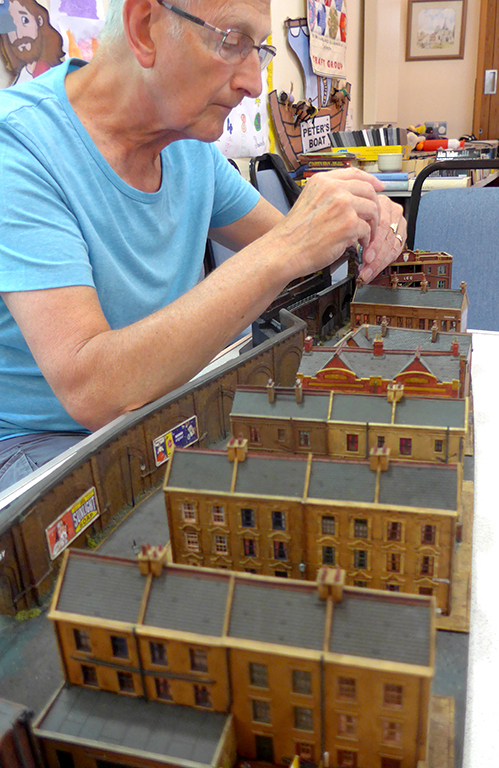 David also has a 'work-in-progress' converting a Merchant Navy to a Battle of Britain. 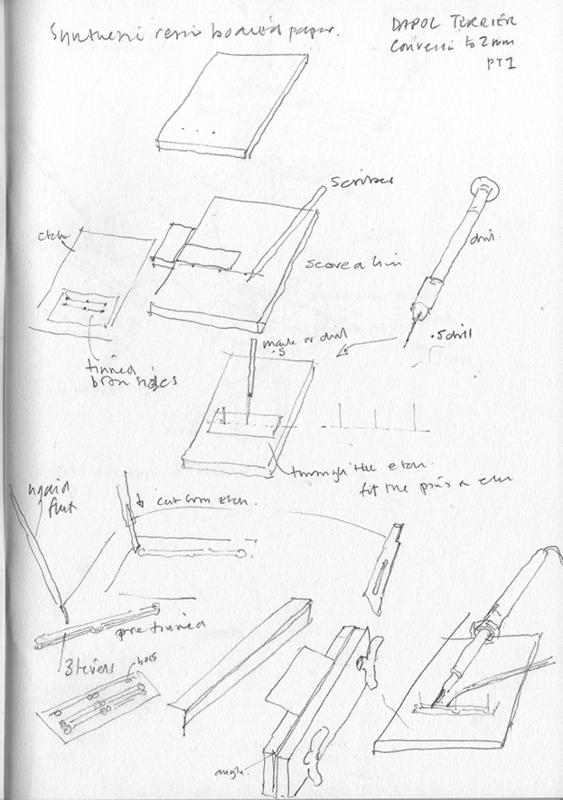 This involves reshaping existing bodies and casting new parts. 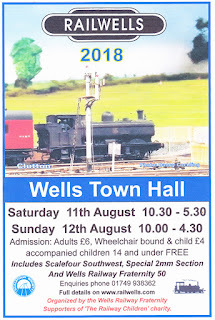 A visit to the Wells exhibition is planned to take the place of the August. 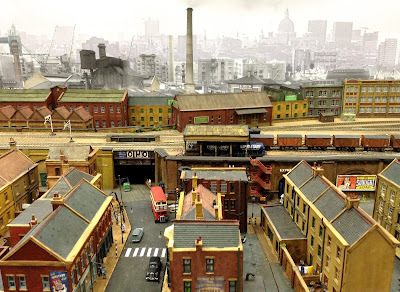 Lighterman’s Yard returned to base at this meeting having been housed at Alan’s and Pete K’s houses after an enjoyable, if at times stressful, Crawley show. 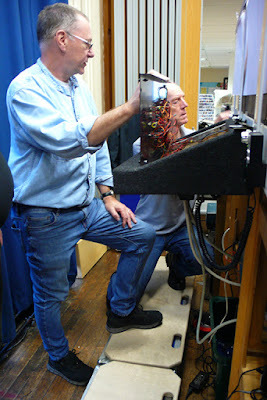 The control panel went home with Keith for investigation into the uncoupling magnet problem (Magnet-gate). 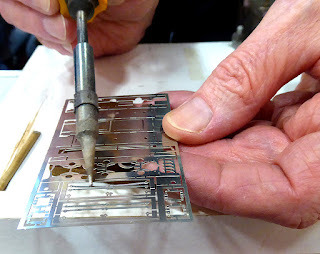 At the meeting Keith reported that he had found a loose wire in the panel which he reattached, although all the switches were fully functional. We started the meeting no wiser as to where the problem lay. 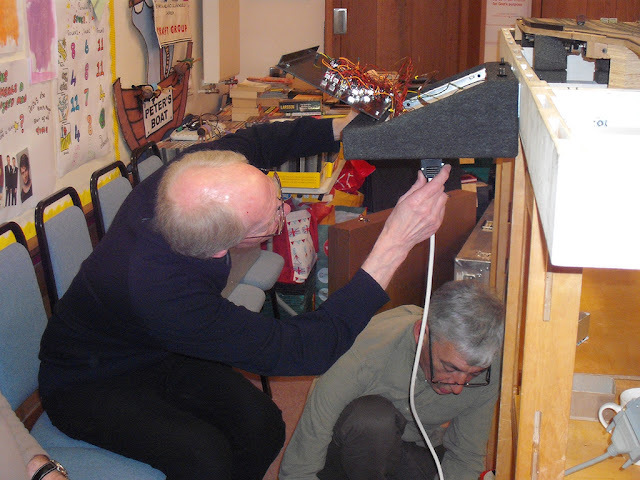 David S and Keith proceeded to probe around in the live power box with a multi-meter just as Pete K took a photo with the flash unknowingly switched on. If a further photo could have been taken a split second later then this report would contain a picture of sheer terror! After the excitement and some more, but flash free, probing Keith and David narrowed down the possible gremlin areas. There is quite a break before the next outing so there is time to gradually narrow things down until the culprit is caught. 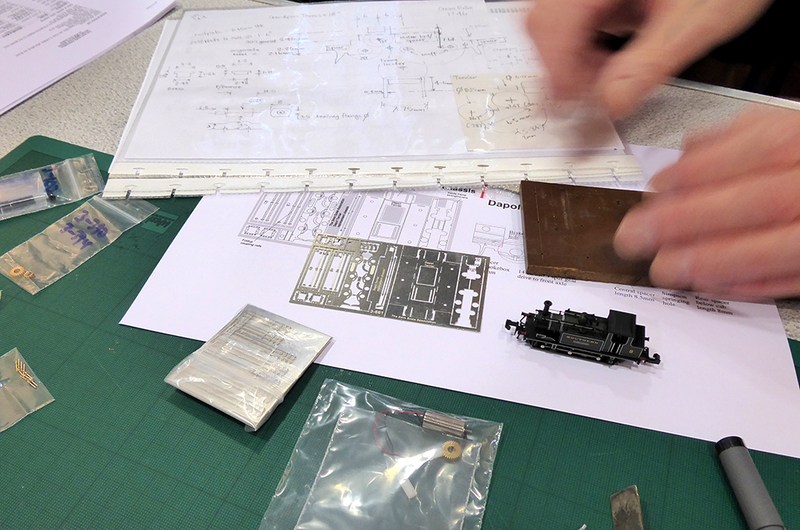 This meeting’s guest loco was Keith’s S & D 7f complete with tender and now recognisable as a 7f as opposed to an assembly of parts on a chassis as seen previously. 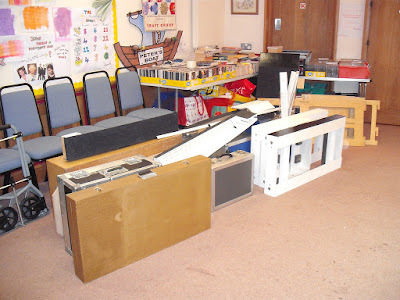 Thanks to Pete King for this meeting's report and pictures.